In a small town nestled in the middle of Connecticut there resides a peculiar lady. She raises bats, tends to porcupines, and single handedly puts on the second largest Icelandic festival in the U.S. Gerri Griswald is her name, and Iceland Affair is her festival. The festival will be happening October 18th in Winchester center, CT at the Winchester Grange. Iceland affair began 5 years ago when Gerri decided to bring some of the acts that had entertained her travel guides in Iceland back to the states. Relying on donations and a very forgiving husband, Gerri has been putting the festival on ever since slowly bringing more and more Icelandic talent stateside so that people who may not be able to make it to the island could experience it’s wonders here. While some would be pleased with just a concert, Gerri has put together a day of presentations including Icelando-centric falconry, goat raising, ornithology, nature and geological talks. 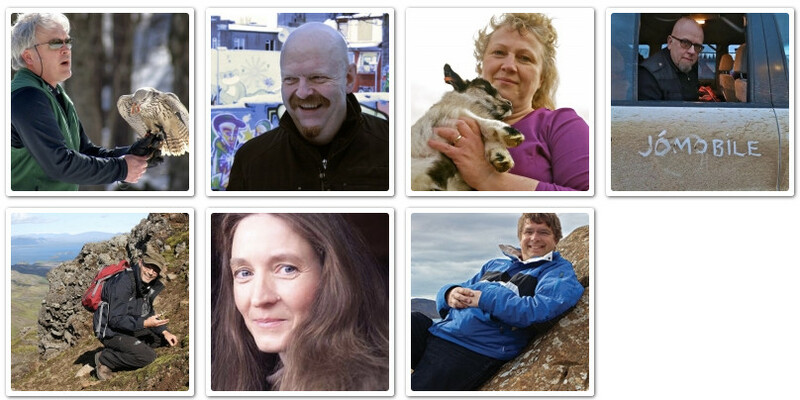 As well as authors presenting on things such as the Icelandic sagas, and the history of Icelandic music. To learn more about the presenters, click the image below. And of course, how could one celebrate Iceland without music. The festival ends with the fire and ice music festival at Infinity hall in Norfolk, CT. The concert consists of 5 well known Iceland artists, ranging from indie, to jazz and folk. From left to right, Svavar Knútur, Lay Low, Snorri Helgeson, Agnes Erna, Kristjana Stefánsdóttir, Myrra Rós, and Bjorn Thoroddsen. Click on their names to learn more about them. While the festival is free for the most part, the concert requires the purchase of tickets, which are selling out quickly, so learn more and get your’s here. Ragnaarbastiaan.com and Theory of Whatever records are pleased to help out with this years festival, and even more pleased to be attending. So if you’d like to learn more about Iceland, hear some fantastic Icelandic music, this is the festival for you. For us it’s the perfect appetizer for the upcoming Iceland Airwaves. Go to Iceland Affair to learn more including directions and places to stay while attending. And we’ll see you there. This entry was posted in gigs, Uncategorized and tagged agnes erna, authors, bjorn throddsen, blue eyed pop, fire and ice, folk, gerri griswald, history of iceland, Iceland, iceland affair, icelandic, jazz, kristjana stefansdottir, Lay Low, Music, myrra ros, Snorri Helgason, svavar knutur on September 28, 2014 by ragnaarbastiaan.